G-EUXM, originally uploaded by dm.photo. Unite, the British Airways cabin crew union, has decided to launch what may be the most ill-timed job action in the history of aviation. The union plans to go on strike for twelve days, from December 22nd through January 3rd, effectively halting BA’s operations during the busy Christmas season. The airline is fighting a rearguard action, trying to have a court halt the strike due to alleged balloting irregularities. Meanwhile, BA’s competitors smile as they twist the shiv. 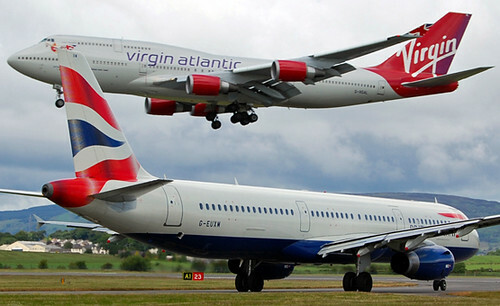 British Midland Airways and Virgin Atlantic have both boosted seat capacity on major routes, to offer the stranded another way to hearth and home. BMI has also granted the use of their own lounges to BA silver and gold cardholders. Some of British Airways’ saner cabin attendants are now contemplating the scope of the PR disaster engineered by their union, realising that kicking the travelling public in the nads during the holiday season might indicate a certain lack of civility and graciousness. Not to mention fatally crippling their erstwhile employer.